T. rex meets his match. Actually, he never has a chance. Roaring to the forest at large that he’s after his breakfast, Tyrannosaurus sends Ankylosaurus, Parasaurolophus, and the rest of the heavily armored dinos fleeing in panic. 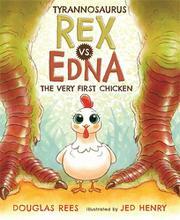 But not Edna, who looks like a garden-variety white barnyard chicken with enormous, long-lashed eyes and a perky beak. She stands firm, responding defiantly to his blustering “I am big and fierce and you should be afraid of me,” with a firm “I am small and brave and you should be afraid of me.” And indeed, when he snaps her up what she does inside his mouth with her “pointy claws” and “many feathers” leaves him a sneezing, pathetic wreck: “I am Ahanasawus Ex….I am ing of e orest.” With a severe “CLUCK!” she chases him away, never to be seen again—and that, children, “is why today there are no Tyrannosaurus Rexes but plenty of chickens.” Using warm tones and pastels to illustrate this altogether reasonable theory (though the author discounts it in his afterword), Henry’s amusing prehistoric scenes feature a variety of recognizable dinos (all save Edna sans feathers) with anthropomorphic expressions.